setup.exe is what is ran after the system finally boots. If you didn't have that, it wouldn't do anything after booting. boot.wim are different that install.wim in that they have a single bootable index. In the typical boot.wim it has the first index "Windows PE" which is used during upgrades and is not bootable. This information gets copied to the $~BTWINDOWS folder during setup and the system proceeds from there. The 2nd index in the boot.wim is bootable and contains most of the same files as the first index except that it is designed for boot installs. The exact difference, I do not know. I know that they are very similar, but one is bootable. As far as the setup.exe's functionality... I know that you need the same file that is in your boot.wim's bootable index root (setup.exe) in the dvd's sources\ folder. If they mismatch because of updates or something, it will give you a driver error during install. Well technically it has to be in the same folder as whatever boot.wim file you booted to. So if you use 2 different folders, the corresponding boot.wim's setup.exe would need to be in the said folder. I "think" they are the same for x86 and x64, but I could be mistaken. I would do your own research if you plan on copy/pasting them around. Think of boot.wim as the setup program and install.wim as the payload. boot.wim only contains the files to run the setup program. install.wim contains what it tries to install. The setup.exe inside the boot.wim will detect the architecture of the index you are trying to install. There's a flag for each index to list whether or not it's x86 or amd64. The overall wim file is not specific to x86 or x64, but each index is. install.wim does not have an architecture. If you have x86 indexes it will try to use those on an x86 setup. If you have x64 indexes, it will try to use those by default. You cannot boot both x86 and x64 UEFI from the same iso. It needs the bootmgr.efi from the x86 version for x86 booting and the x64 version for x64 booting. I don't believe that the boot sector affects uefi booting. I think it's determined by the bootia32.efi, bootx64.efi and bootmgr.efi files. I really don't think you can dual-uefi-boot the x86 and x64 without modding the efi files to point to different bootmgr.efi files. Actually after reading murphy msgs , I was thinking about merging indexes of x86 and x64 into 'x86_boot.wim'. But now I decide to use both 'x86_boot.wim' and 'x64_boot.wim' in place of using only 'x86_boot.wim' because modification is looking very complex.. I want x86 UEFI booting because of increasing WIN Tablet around. Are you totally sure that 'bootmgr.efi' is not used at USB disk. Is it necessary to use 64-bit 'install.wim' in order to install 'Win 8.1 U1' into 64-bit UEFI firmwar/system ? Can I also use 32-bit 'install.wim' in place of 64-bit 'install.wim' ? 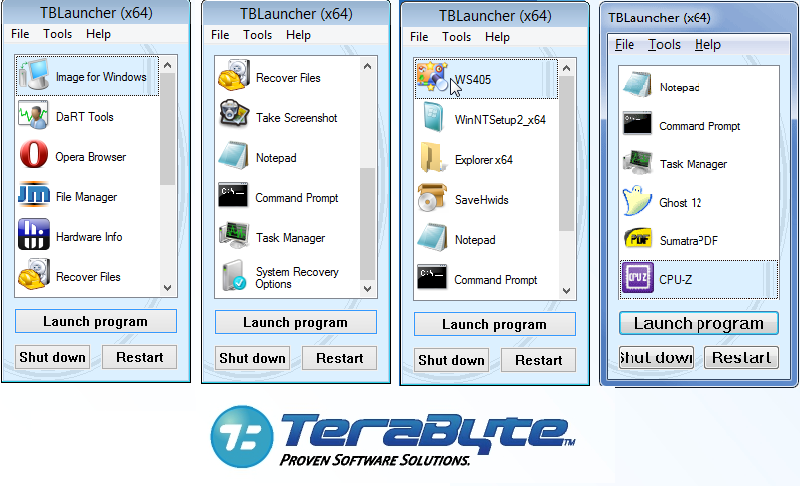 I've just found a new free app-launcher called TBlauncher (created by Terabyte Unlimited). There are 32bit and 64it versions. Looks like a good alternative for Pstart. So now we have a good standalone FREE app launcher for whichever architecture we want! Remove winpeshl.ini and add modified startnet.cmd to launch TBx64.exe and Recovery Environment. TBx64.exe will search for TBLauncher64.exe found e.g. in in root of USB-stick. All Apps can be in root of USB-stick and launched from TBLauncher Menu. 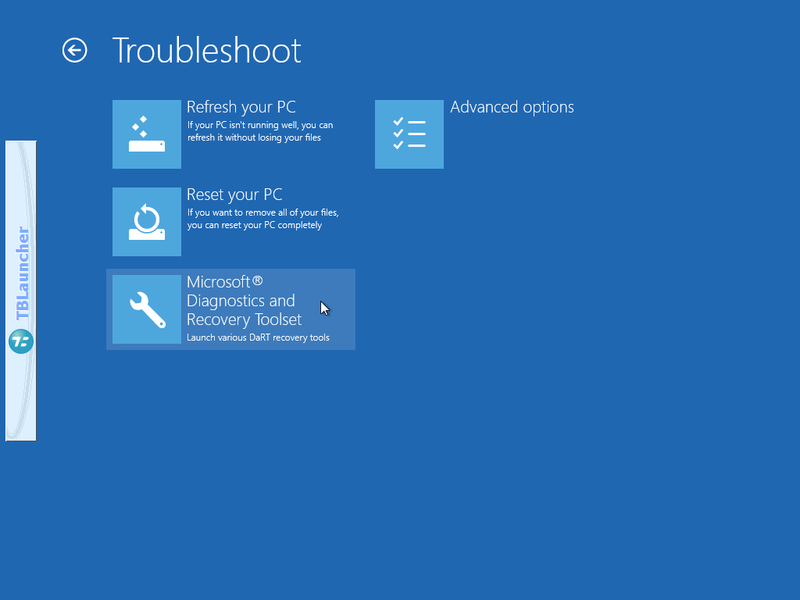 On booting from USB-stick then Recovery environment appears auto with TBLauncher Menu. I would like to make better picture. Do you know PrintScreen program that works in x64 Win8 Recovery environment ? in both UEFI (both x86 and x64) and BIOS mode. I will also use 'TBLx86_boot.wim' and 'TBLx64_boot.wim' in order to extract/install 32-bit Win 8.1 U1 'install.wim' into Local Hard disk of PC/Tablet in both UEFI (both x86 and x64) and BIOS mode. If anybody know about the whole procedure for creating 'TBLx86_boot.wim' and 'TBLx64_boot.wim' , then please tell me about the Step by Step procedure. It means both 'x86_boot.wim' and 'x64_boot.wim' may be same if we copy required 64-bit UEFI files into 'x86_boot.wim' . And then we can also use modified 'x86_boot.wim' in order to UEFI booting in x64-firmware/system. But for it we have to points efi\microsoft\boot\bcd to 'winload.efi' from within the modified 'x86_boot.wim' instead of 'winload.exe'. Can you describe more detailed? Which steps are required to boot a x86 boot.wim at amd64 hardware? I get a error 0xc0000359 ntoskrnl.exe could not be loaded. Read the x86 kernel fails at UEFI amd64 boot. What's the reason to support x86 at UEFI? I expect 4 GB RAM at a UEFI machine. 1- In case of 'WTG + WIMBoot + VHDX' , VHDX reduces overall Windows Installation time because during Installation I put VHDX within Hard disk and when Installation become complete then I copy VHDX from Hard disk to USB Drive. If I don't use VHDX then Windows Installation take hours. Actually I use very complex Multiboot configuration in my USB Drive. In case WIMBoot become corrupt then I don't have to format whole USB Partition. I only delete VHDX file and re-install windows within it. Suppose currently I am booting from 'WTG + WIMBoot + VHDX' and I want to re-install WIMBoot within USB drive. So there is neither need to format whole USB partition nor restart System multiple times. I will create a different VHDX file within USB drive and install windows within it. And after one restart second VHDX will become ready to use. I can copy IMP. data from 1st VHDX to 2nd VHDX easily. And then can delete 1st VHDX without any problem. So, If I use VHDX along with WIMBoot, then it save overall Windows Installation time, allow easy re-installation of WIMBoot without any hard work, better management of Windows Installation. 2- In case of 'WIMBoot + VHDX', VHDX allow me to have Dual/Triple OS in a single Partition of my Internal Hard disk. And there is no need to keep one OS in one partition. And there is no need to format any partition of Internal hard disk again and again. I format only VHDX in order to re-install various WIMBoot's within C: drive of my system. 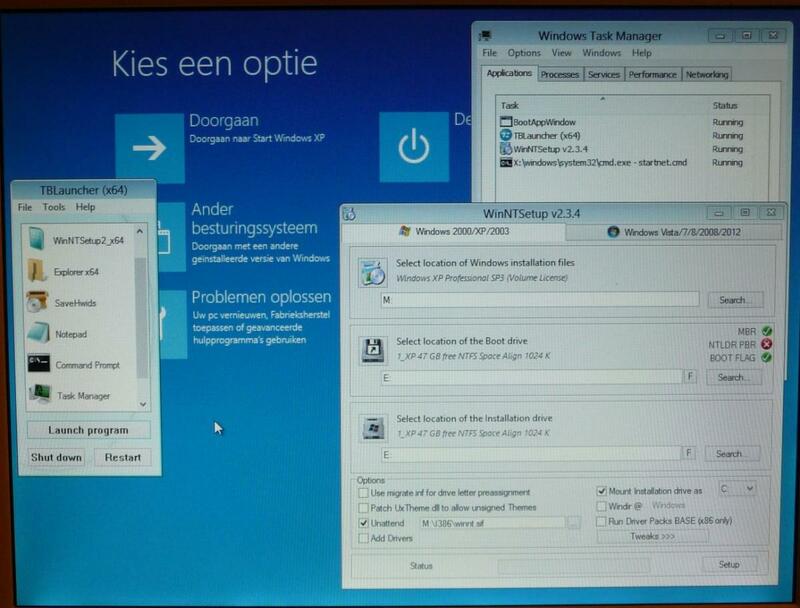 I use AIO 'install.wim' file in my C: drive along with both 'Win8.1Pro.vhdx' and 'Win8.1Ent.vhdx'. So if one OS will become corrupt then at lease 2nd OS work properly. 3- I can copy 'install.wim + VHDX + Boot files' from Hard disk to USB and vice-versa during emergency. 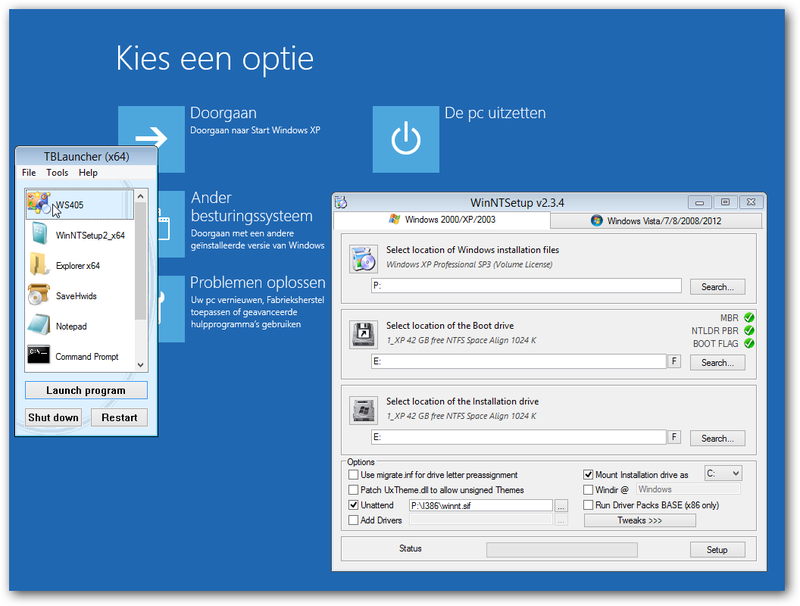 4- We can also transfer 'WIMBoot + VHDX' form one PC to another PC just by copy paste process. And there is no need to repeat whole windows installation again and again. Note- I always use dynamically VHDX files because it doesn't consume unnecessary space within drives. Can anybody please tell me about the use/role of above .efi files during UEFI Booting ? Should I use 'altmbr.bin' from SYSLINUX package which allows to boot partition by number ? Can anybody help me in finding CMD commands which will Unhide Hidden Partition (PTN2/PTN3/PTN1)' ? Finally I got my new 'SMART_USB.cmd'. if exist "%systemdrive%\Program Files\RMPrepusb\RMPartusb.exe"  pushd "%systemdrive%\Program Files\RMPrepusb"
if exist "%systemdrive%\Program Files (x86)\RMPrepusb\RMPartusb.exe" pushd "%systemdrive%\Program Files (x86)\RMPrepusb"
rmpartusb% LIST | find "DRIVE"
I want to backup MBR to LBA31, LBA32 and LBA33 whenever PTN1, PTN2 and PTN3 become accessible to Windows. So what code should I use in place of '????' ? I use 'GetLine.cmd' along with 'Restore_PTN.cmd' and 'SMART_USB.cmd' in order to set 'Master Password' for authentication.
) Do If Not Defined Key Set "Key=%%#"
If Defined Line Set "Line=!Line:~0,-1!" If Not Defined Line (EndLocal &Set "Line=%Key%"
"!Line!") Do EndLocal &Set "Line=%%#%Key%"
I am also using slightly modified 'RestoreMBR'. Actually following is the whole setup which I always keep within 'SMART USB' directory within my PC. 2- I also have to keep a .txt file in following format along with all .imgPTN payload files (Except WTG.imgPTN) in order to backup CSM-MBR of each.imgPTN payload files. So that I can switch to any .imgPTN within from UEFI System without changing BIOS mode.. When I want to to re-create my fully working 'SMART USB' , then I just have to double click 'SMART USB' shortcut in the Desktop. And then 'SMART_USB.cmd' ask for USB selection just after 'Master Password' authentication (Password = fred). After choosing desired USB Drive it first delete all previous contents of PTN2 and PTN3. After that it automatically copy contents of DATA, E2B and WIN folders intoPTN1, PTN2 and PTN3 of my USB Drive respectively. It also set hidden attribute to each files and folders except 'SMART_PTN.exe'. if not "%AUTORUN%"=="1" set /p ask=WHERE YOU WANT TO SWITCH ? attrib +h +r +s /s /d %USBDRIVELETTER%\"Smart Apps"
attrib +h /s /d %USBDRIVELETTER%\"WELCOME.exe"
if not "%AUTORUN%"=="Y" set /p ask=WHERE YOU WANT TO SWITCH ? echo MBR Restored OK - please disconnect and re-connect the E2B drive now. :: MUST NOT USE USB drive to store .TMP file as RMPartUSB cannot access it after dismounting the volume! echo Sorry - you need to run this script as Administrator. echo Please use right-click - Run as administrator. Windows supports two types of PC firmware: Unified Extensible Firmware Interface (UEFI), which is the new standard, and legacy BIOS firmware, which was used in most PCs shipping with Windows 7 or earlier version of Windows. Each firmware type has completely different Windows boot components that are incompatible with each other. Beyond the different boot components, Windows supports different partition styles and layout requirements for each type of firmware as shown in the following diagrams. This presented a unique challenge for Windows To Go because the firmware type is not easily determined by end-users—a UEFI computer looks just like a legacy BIOS computer and Windows To Go must boot on both types of firmware. 1- Create 3 Partitions in your Removable USB Drive as follows with the help of BOOTICE. 2- Set FAT32 'E2B' Partition as Active and make NTFS 'WIN' Partition accessible to Windows with the help of BOOTICE. will show all partitions of 'Removable USB Drive'. 4- Copy Win 8.1 Update 1 'install.wim' file within Root of NTFS 'WIN' Partition of Removable USB Drive. 5- Now Run 'WinNTSetup v.3.7.5' and create Dynamically Expanding VHDX file within your Internal Hard Disk. i.e. C:\Windows X.vhd , which will be mounted automatically as Z: Drive. 8- After completing copying process Restart your PC in order to start 'Sysprep' phase. 9- Now you have to Boot from your 'Removable USB Drive' successively 3 times whenever system will RESTART. So Please Boot from your 'Removable USB Drive' until your reach to Desktop of WTG. 10- After three successive booting from your 'Removable USB Drive', You will reach to the Desktop of WTG. 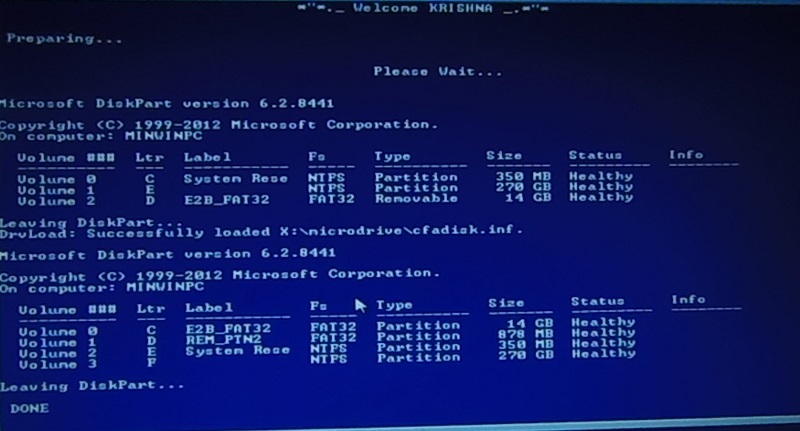 12- After Installing 'Microdrive (cfadisk)' Restart your System and 'Boot from your Internal Hard Disk'. 13- Now copy C:\Windows X.vhd file to the Root of NTFS [WIN]: Partition of your Removable USB Drive. Where K: is Drive letter of FAT32 'E2B' Partition of your 'Removable USB Drive'. Removable USB Drive in order to Apply Changes). Now you will see only one partition of your 'Removable USB Drive'. 18- Now Boot from your 'Removable USB Drive' and you will Boot to Complete "WTG + WIMBoot + VHDX"
1- Create 'E2B' and 'WIN' folder in the Desktop of your Main OS. 2- Copy all contents of 'E2B' Partition to 'E2B' folder and all contents of 'WIN' Partition to 'WIN' folder. 4- Now Copy all contents of 'E2B' folder to 'E2B' Partition and 'WIN' folder to 'WIN' Partition. 6- Now Boot from your 'Removable USB Drive'. It will still successfully Boot "WTG + WIMBoot + VHDX' configuration. 2- Create a folder 'Mount WIM' in the root of C: Drive. 6- Now \sources\boot.wim is ready to load 'install.wim' file within from ANY Partition of 'Removable USB Drive'. Posting how exactly to do this mounting/dismounting would probably be appreciated. cmd /q /c "FOR %%i IN (C D E F G H I J K L N M O P Q R S T U V W X Y Z) DO IF EXIST %%i:\AUTO.CMD cmd /k %%i:\AUTO.cmd"
in mysetup.cmd, when everything else is "hardcoded" to paths on the X: drive. I have done this using an AutoUnattend.xml from a removable drive and an unmodified Win8 ISO file. drvload runs ok but it says it needs a reboot to take affect (which I obviously cannot do with WinPE). The other partition on the USB removable drive does not appear until I unplug the USB drive and re-insert it. I am not sure to understand your report/the issue . Though it is not entirely clear, the approach devadev explained is about a "preliminary step" to modify (offline) the boot.wim BEFORE adding it to an USB stick. Once you have run drvload and unmounted the boot.wim, the next time you boot from the boot.wim it should be able to have the cfadisk installed and thus see the non-first partition. (there is no unplugging and re-plugging of anything involved and the boot.wim is not booted into until after having being modified). should not even work if a reboot is actually needed. 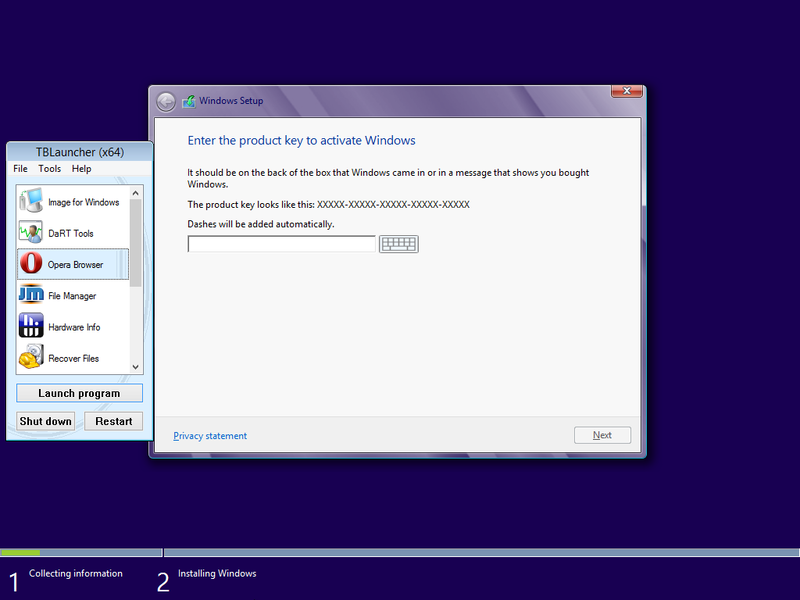 It is entirely possible that the message you get is a "deceiving" one, maybe it is the Win8 that behaves "strangely". And to add a filter driver a reboot should not actually be needed, though the "unplug and re-plug" should actually be needed (or maybe killing and restarting the current shell would do as well). I tried devadev's method using Win 8.1 x86 boot.wim and it worked. The screenshot shows that no reboot message occurred and the REM_PTN2 which was the 2nd partition on the removable flash drive was visible after the driver was installed. It does seem to completely change the drive letters though!!!! presumably because the removable drive is now seen as a hard drive. So there must be a difference somewhere in timing using the winpeshl.ini [LaunchApps] section compared to when the \AutoUnattend.xml detection starts. I think the winpeshl.exe first looks for winpeshl.ini - if it exists then it runs it and theAuto,cmd and then runs setup so no shell is launched. If it does not exist it runs wpeinit (from startnet.cmd) which then looks for \Autounattend.xml. This is a shame as I was hoping to use the driver with \AutoUnattend.xml so I could add cfadisk to any Windows Install ISO without needing to open the ISO at all! P.S. The reason why devadev likes this method is that it should (??) not break Secure Boot if used in a EUFI payload as the driver is unsigned. If it was added into the WinPE itself, then you would also need to fiddle with the BCD, etc. @Wonko - thanks, I tried using devcon and other utilities to dismount/remount, etc. but none worked. About drive lettering change, I can see that it is *needed*.